I was reading statistics about blogs in the paper today and one of the thing mentioned, was that once you create one you must keep feeding the beast on a regular basis, otherwise your readership plummets. Oh what the hell, I'm not looking for fame. So on to my projects OK? Hmm, what shall I do with this fabric? It worked out pretty well I think, and fast too! Mind you it's just the top. I want to hand quilt it but I want it to be portable, you know, take it on a picnic. So if anyone has pointers on using a quilting hoop, I would greatly appreciate any advice. I'm not worried about being too precious about it, since it will be my first hand quilting and sort of a practice piece. Hell, I didn't even cut the fabric, I tore the strips. I'm going to use cotton batting rather than polyester for the fill. 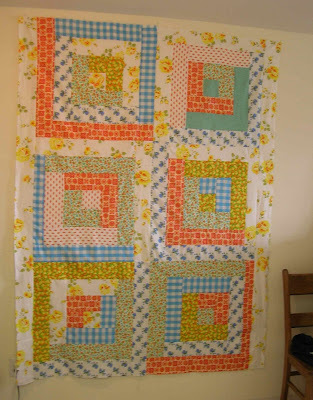 I like the look of the old flat quilts rather than the puffy guys. You know I think us crafter type bloggers are different...we understand how creative juices work and length of projects finished or otherwise. Just because one doesn't update blog that offten I don't take it off my list...it would have to be MONTHS and then I might do a comment just to see if they respond! Your quick quilt looks absolutely comforting to me...something from my childhood, but I can't put my finger on it. Big hint I got for quilting in a hoop (I've only done it once) is...don't leave quilt in hoop overnight if you take a break. I find wooden ones better than the plastic ones...hope this helps. Look forward to see pics of your quilting design! You made it with handquilt? It's look a great work and need a patient to mix and match the pieces.